What am I referring to? …The humble ferret of course. 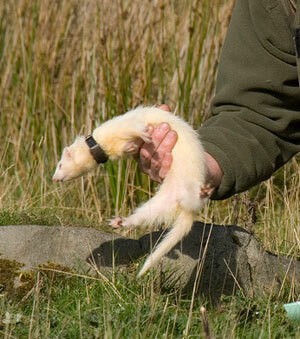 Is there anyone out there that started out in this glorious hunting game without the aid of a trusty ferret? Not many I bet. I know I did, and so did most of my contempories too. 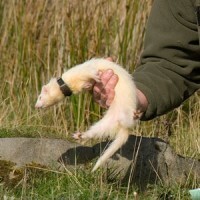 Yes, the ferret has a great deal to answer to.This ancient pastime is ideal for youngsters starting off in hunting; they don’t need much equipment and very little money is required once they have bought a handful of nets. My ferret has just died and now I find myself, for the first time in two decades, without a mustalid companion. For the past two years the rabbits locally have been a bit thin on the ground, and I have been diverted by other pleasures as well. There’s only so much you can do with the available time isn’t there and so I have decided not to get another one until ferreting prospects improve sometime in the future. I have had many offers from my mates that if I ever need a ferret I can take one of theirs for the day whenever I so wish. It was just after my tenth birthday that I acquired my first ever ferret. The local alcoholic ferret keeper “Old Eddie” promised he had got me a Jill and I could have it as soon as my father had made me a hutch. The days passed and soon a brand new hutch was installed in the garden, and, as promised, a young albino Jill became my proud possession. To me this ferret was the best thing since sliced bread and she was handled relentlessly. That ferret wouldn’t have ever bitten anyone; in fact, I bet she was sick of the sight of my little pinkies mauling her without respite. Back in those days I never owned a ferret carrying box or even a shop bought ferret bag. Instead I used cloth moneybags and stitched some washers into them so the ferret had an unrestricted air supply. There was only one thing I needed before we could go out into the fields and catch hundreds of rabbits, and that was nets. At the time I used to read the Shooting News, perusing the pages from cover to cover. Reading those intoxicating stories and hunting tales from all the popular writer; The Warrener, Lloyd on lurchers, The Airgunner and Daergi to name but a few. Even though only in my thirties my memory is deteriorating about every day events, but I can remember twenty years ago as if it happened only yesterday. I just couldn’t comprehend how lurchers would catch foxes like in those deargi articles. I imagined that they were wonder dogs, the likes of which I would never own. Of course, such dreams are good for a young lad, having something to aspire to fuels enthusiasm. It was in the shooting news that we scanned the articles for purse nets and my father purchased ten three foot hemp ones, completing our rabbit catching arsenal. All that was left to do now was to get out there and do it. It was early one Sunday morning that my father and I ventured out with my ferret. A sharp whore frost had been afoot during the night making the ground hard and the fallen leaves crackle like cornflakes as we walked. “Ideal bolting conditions” I was told. Then, as we rounded a large dead Elm, we startled a solitary bunny that must have been soaking up some of the meek winter sunshine. Things could not have gotten more perfect for this bunny ran about ten yards uphill vanishing into a well run hole. Perhaps Saint Hubert had sent this critter down from above to help get a little ten year old lad totally obsessed with rabbiting, well, if he did, it certainly worked. I watched silently as my father showed me the basics of setting a net. This solitary hemp web was laid over the hole; its shiny new ring was tucked well under the earth to aid the pursing action of the net. I couldn’t wait to go and get the ferret, but no. Not yet. We scurried down to the bottom of the hill and had a cup of tea, and never has a cup of tea taken so long to drink! I had gulped my own red-hot beverage down, but my father was in no rush. The reason, I was told, was to let the rabbit settle, so it would, hopefully, bolt more readily. Which is, of course, true, if a rabbit is ever ran to ground there is little point dropping a ferret in immediately behind it if you want a bolt. Soon enough the little pink-eyed albino was allowed to enter of her own free will. She scented the entrance for a moment before waddling off out of sight in the dark aperture. I stared at the net, ready for this prized bunny to be captured, well; I thought I was ready, for when the rabbit did bolt I nearly jumped out of my skin. It was a textbook bolt and the net had pursed perfectly. Needless to say, I barely slept that night due to the mental vision of that lone bunny. That was it, I was hooked! Not long after, I managed to scrounge half a dozen nylon nets of my own and venture out in the fields scouring here and there for any hole to ferret. Back in those days to catch one rabbit was an achievement, but to get two was a real red-letter day. Little by little our methods improved each season and we ventured further and further afield finding better places. By then I had my first proper lurcher and together we spent every weekend during the autumn and winter ferreting. Mostly the same holes each week, but we always managed a few rabbits. My eyes were well and truly opened when we first headed up the Yorkshire dales and saw the amount of available ferreting up there on the rough uncultivated fields. The first visit saw two of us take 33 bunnies in a short period of time and that was to become the norm for that area. I was using a very smart little polecat Jill back then. She was dynamite and if she stopped in one place for a minute then you knew she had killed. The warrens up on that high ground are only a foot deep and so the digs only took a minute, thank god. I don’t know how that little Jill used to do it. I have owned dozens of different ferrets and most of the time, when dug out, they are at the rabbits back end, but this particular Jill would always seem to have killed them by the time I broke through. That ferret was a real character and she was very good with my dogs too. One time we were ferreting on a hot day in august and I had bought an ice cream from the kiosk parked in the car park of a public park. The ferret would sit in the open boot and eat ice cream off of my fingers. Yes, the ferret is responsible for many of us getting into dogs, perhaps we have drifted away from ferreting a little, but I’m sure most of us will drift back again one day in the future. Long live the ferret.